Add a piece of nature to you ensemble with these dried plant earrings. Earthy, elegant and unique, these nature-made earrings add an eco-chic touch to your ensemble. Artist Maggy Ames creates her fresh-from-the-garden jewelry from parchment-thin pieces of dried vegetation selected for its unique color and texture. Delicate layers of dried and pressed fruits and vegetables are shaped together and complimented by peridot and garnet gemstones. Each earring is then finished with scrolling gold vermeil posts. Handmade in California. 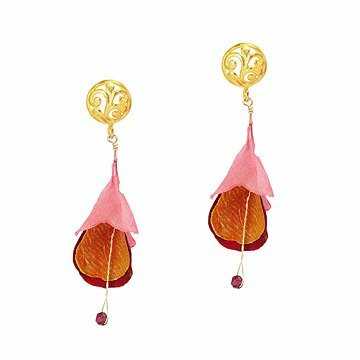 Beautiful earrings that everyone comments on, favorably, she they see them. I got the pink tones and the earrings are lovely. Enjoy them if you purchase. Speaking of which, I got them because I liked them, not for any occasion.